My desktop had a mandatory update on Nov 1st and, while it came with firm assurance that 'nothing would be lost', several addresses and files were arbitrarily dropped and the ability to add a background pattern to my emails vanished. Argh! In the meanwhile, as the November chill creeps into St Paul, my home is warm and, even better, my husband steadfastly stays by my side despite my narrowness of heart, at times. Bearing fresh perspective, this gratitude happily wins, hearkening to my father's reminders in my formative years that gratitude turns what you have into enough. Just as recent circumstances blind-sided me from noticing a more blessed place of reality, so too as we offer our weekly Holy Hours as Seven Sisters, a very real treasure therein may be overlooked. In the blur of the practical sacrifices to get to our prayer times and in the real work of an intense focus of our intercessory prayers, it may remain unnoticed. It involves gratitude for the fullness of the call we have as intercessors. While we likely embrace and even, at times, sense the privilege of our prayer efforts for priests, there is something equally beautiful underlying our efforts that we may not as readily sense. Our principle charge is to pray for the needs and the sanctity of a priest, but we do well to remember that our own holiness is in the equation too. This is beyond the good feelings of accomplishing what we committed to do. In fact, we may not bear any feelings regarding this aspect of our Seven Sister prayer offering. Consider this: "Holiness is produced in us by the will of God and our acceptance of it, says de Caussade (Abandonment to Divine Providence). "...with childlike willingness, accept all that God presents... What God arranges for us to experience at each moment is the best and holiest thing that could happen to us. ... Without Him everything is nothing, and with Him nothing is everything. We may meditate, indulge in contemplation, pray aloud, practice interior silence...and though they may all be valuable, there is nothing better for us than to do what God wants at any particular moment." Even the desire to be a part of this Apostolate had its genesis in God. We cannot claim the desire. He both fore-ordained and instilled it. He called each one of us to respond (or not) to it - not only in the beginning, but He beckons us forth each week. We live in the Hands of God. Our Faith allows us to see Our Lord continually drawing us into a cooperation with His grace. Like St John we can say at any moment, "It is the Lord!" and like St Peter we can respond to "spring into the sea" (John 21:7). While our motivating factor as a Seven Sister is most certainly not "what will I get out of this", there is both a sweet and fiery reality that as we remain faithful to our commitment to the weekly prayers (and for as long as God calls us to do this), we are indeed growing in holiness. Every God-given call on our lives supports the universal call to holiness and supports His plans to prosper us. Divine economy builds this in. "In reality, holiness consists of one thing: complete loyalty to God's will... Perfection is neither more nor less than the soul's faithful cooperation with God...Our only satisfaction must be to live in the present moment as if there were nothing to expect beyond it" (de Caussade). My prayers as of late have been that each of us will intensify the love in our prayer offerings, and embrace the graces to savor all of the moments of the Holy Hours we offer - on every level, felt or unfelt. In faith, we do not waver from the belief that He lavishes His graces (Eph 1:6-8, 18, 2:7, 3:8). "A secret working of the divine wisdom is to pour treasure into the heart whilst impoverishing the sense, so that the one overflows whilst the other is drained and emptied" (de Caussade). He protects us from knowing the workings of His graces, but our joyful witness cannot keep hidden the reality of His hidden work in our hearts alongside His hidden work in the hearts of the priests for whom we pray. "So, dear souls, let us love, for love will give us everything. It gives us holiness and all that accompanies it. It is all around us and flows into every receptive heart. O what a thing is this holy seed which ripens into eternal life! We cannot praise it enough... we must be active in all that the present moment demands of us" (de Caussade). Let us embrace the moments of our Holy Hours! - for the benefit of the priest and for our benefit! Grace upon grace, gratitude upon gratitude... we indeed live the richest life! 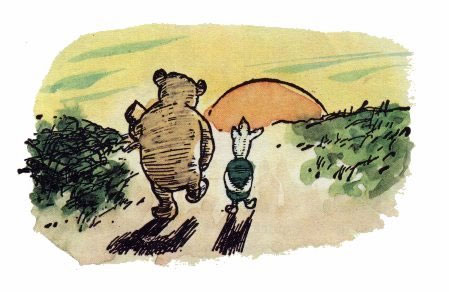 ... eternal gratitude continues as you each remember to offer a wee Hail Mary for me every day.... Pray that I will not 'spoil the beautiful work that God has entrusted...' (St Mother Teresa) And one more thought from Pooh: "We'll be Friends Forever, won't we, Pooh?" asked Piglet. "Even longer," Pooh answered. SPANISH translation of Communique: This is generously done every month by Zahyra B, Anchoress for a Seven Sisters group in Venezuela. They are then posted (and archived) on the Website. If it is easier to receive through an email account, please let me know. Zahyra made an 'appearance' via mini-video at the St Paul-Mpls Archdiocesan Time of Recollection on Nov 4. She is JOY personified! REMEMBRANCE of those SEVEN SISTERS who have PASSED: We want to remember those Seven Sisters in name and in prayer, who have gone before us to their eternal rest. Visit the Web site. Click on ABOUT folder and scroll to bottom, choose: IN REMEMBRANCE. Follow prompts... OR you may submit info via the Website email or to my email address. Gratitude to Janela H for hosting informationals in Rochester, MN, on Priesthood Sunday (Oct 29). Gratitude to All Saints (Lakeville, MN) Seven Sisters groups for organizing a most memorable and grace-filled Archdiocesan time of Reflection (and gratitude to the 400 who registered) on Nov 4. Gratitude to Doreen P who is the newly assigned St Paul-Mpls Archdiocesan Coordinator and will help form and lead a team of Seven Sisters members to pray for and look to forming groups for priests currently not covered in this type of prayer. If interested, indicate through Web site email. Gatherings in North Dakota, Georgia, Nebraska, Florida remain in the prayer/discernment stage. RAISING AWARENESS: Let us together remain open to starting groups for priests that are perhaps less visible (those not in a traditional parish setting). Examples: Hospital Chaplains, Military Chaplains, Monasteries, Professors in Universities, School Chaplains, Retirement Home Chaplains, Canon Lawyers, priests serving in Seminaries, Chanceries, Exorcists, and Retired priests. If you sense a call to this Apostolate, there is a priest or bishop who needs your prayers!